Interior shutters are a permanent enhancement to your home. The colours and finishes available mean that shutters can provide a light contemporary feel, or be equally at home in a cosy cottage. Shutters provide privacy when you want it, or can open out to let the maximum light in and let you admire the view. I supply and fit Sandringham Shutters in premium stained or painted hardwoods, painted wood composites, and vinyl finishes. There is no high pressure selling, I just show you the options and listen to your requirements, then I provide a written, itemised, quote allowing you to make your mind up at your leisure. 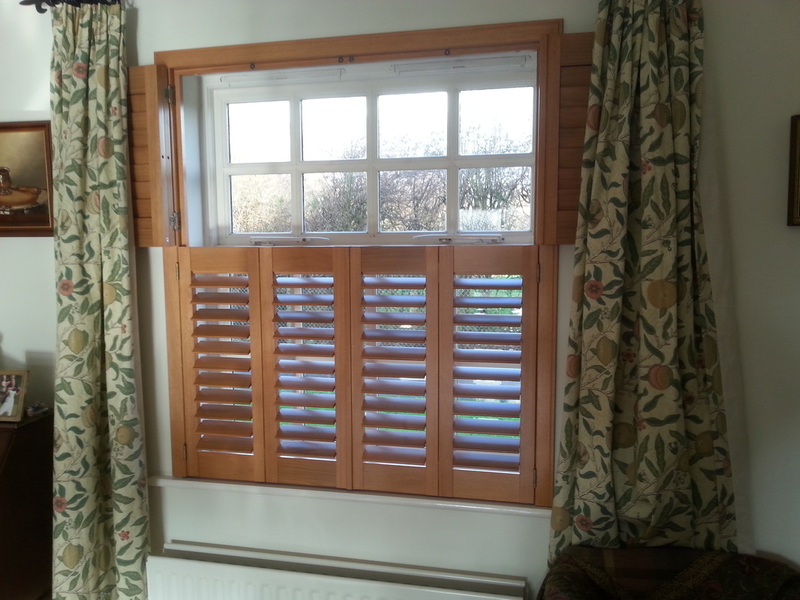 Shutters are an ideal treatment for bay windows. They enhance the look of the bay and allow the maximum use of the light and space instead of simply hiding the bay away behind curtains. Tier-on-tier style splits the shutter doors into separately opening top and bottom halves. Particularly useful if you want to keep the bottom half closed for privacy and open the top half for the view. Where there is a large space to cover, such as patio doors, shutters can be hung from a track so as to allow a large set of doors to be folded back.